Shares of Six Flags Entertainment Corp (NYSE:SIX) were only up about 5.5% in Wednesday’s pre-market trading session. But those gains more than doubled once the regular trading session began, with SIX stock jumping 12% in early trading. A loss of 74 cents per share came in ahead of expectations calling for a 78 cents per share loss. However, revenue soared, climbing almost 30% year-over-year to $129 million. This came in almost $10 million ahead of expectations. The company’s fiscal first quarter is always weak like this, so getting a feel for Six Flags stock can be difficult at the moment. But we shouldn’t judge the company solely by these results (even if they did come in ahead of expectations). Remember that SIX operates 19 amusement parks in North America and has several parks opening in China and the Middle East. Once the weather warms up and after school lets out for summer, Six Flags’ operations will do much, much better. Given that most consumers have a little more money in their pocket, I’d expect attendance to increase even more than the 500,000 bump it saw this quarter, to 2.4 million. It’s not just the domestic economy that’s gaining steam, it’s the global economy that’s improving as well. Should We Buy Six Flags Stock? Management is banking on a number of growth initiatives to improve growth and operations. A lower corporate tax rate will surely help in that regard. The company is relying on higher park ticket prices, a strategy Walt Disney Co (NYSE:DIS) has also tapped. International growth, new water parks, its dining pass and the all-important Active Pass Base are all driving these growth pillars. “We are firing on all cylinders as we made excellent progress in the quarter against each of our five growth initiatives,” said Jim Reid-Anderson, chairman, president and CEO. So what exactly does this growth look like? Analysts expect revenue to increase 6.6% this year and another 5% in 2019. Despite this mid-single-digit growth, analysts expect earnings to explode roughly 28% this year and another 11.4% in 2019. We should see a big boost to margins when the top line posts modest growth and the bottom line swells significantly. On a trailing basis, shares currently trade at 28 times earnings. But I don’t like to use trailing metrics, because it’s based on the past and the market is forward-looking. Six Flags stock trades at about 21.5 times this year’s earnings and at ~19 times 2019 earnings estimates. Screamingly cheap? Not exactly. But SIX has very solid bottom-line growth and good top-line growth. Management has a realistic plan to grow these initiatives — and don’t forget about the dividend yield of 5.25%. That’s a hefty payout for any company, especially for one that will benefit from a lower tax rate and has a solid growth plan outlook for the next few years. The average price target for SIX stock sits at $76.50, which is now just 15% away from current levels. However, the Street-high target sits at $80, just above the average and about 22% above current levels. Can it get there? 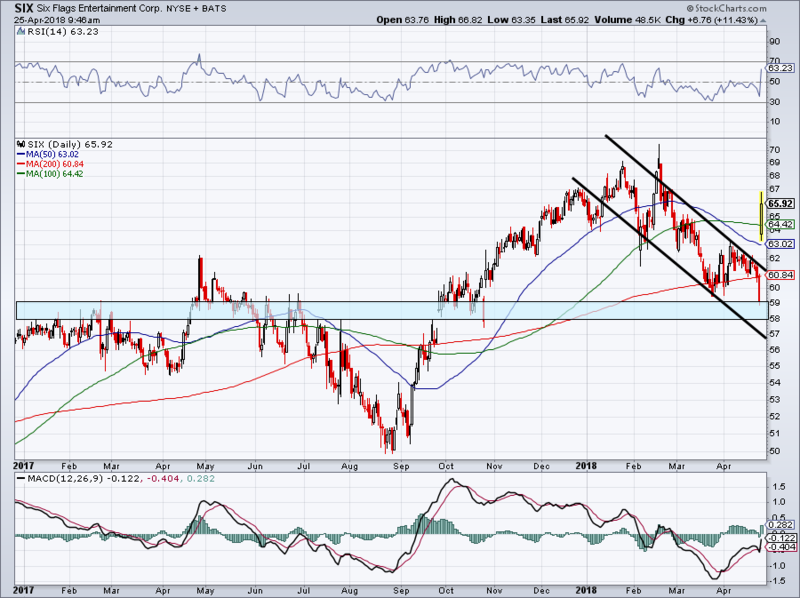 I think SIX stock can certainly retest its prior highs around $70. With Wednesday’s gap higher, shares are now above all three major moving averages. 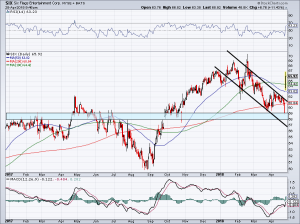 It’s also out of the that bearish trading channel that was dragging Six Flags stock lower. If it can consolidate and base, it will give shares the runway to rally this year. I wouldn’t go all-in at this point — not after this big one-day rally. However, investors looking for yield and potential upside in 2018 should certainly consider SIX at this point. It has a lot of momentum working in its favor. Bret Kenwell is the manager and author of Future Blue Chips and is on Twitter @BretKenwell. As of this writing, Bret Kenwell was long DIS. Article printed from InvestorPlace Media, https://investorplace.com/2018/04/six-flags-entertainment-six-stock-rally-earnings/.